Oh, the confusing world of adolescence. The A story: the McCall pack considers the wisdom of inducting a new member while also warming up to their senior year of high school. The B story: a fellow student named Tracy deals with “night terrors” of the distinctly paranormal variety. In terms of style, we see an interesting continuation of the elemental motif—water rapping at Tracy’s chamber window, fire burning inside Parrish, air becoming Lydia’s superpower, Stiles and Liam following Theo’s footprints in the earth. While talking to a school counselor (Lydia’s mother), Tracy recounts her night terror of falling off a chair, reminding us that there’s no greater villain than gravity. Having her vomit crude oil and crow feathers onto the school counselor’s desk is a stronger image, of course, but that’s probably just a cry for help. Puberty is a complicated experience in Beacon Hills, often involving black bile and inappropriate bodily reactions. Lydia and her mother then have a stage-whispered discussion about the correct response to Tracy’s problems. Mrs. Martin is of the opinion that a black gastric geyser is totally normal, which makes her about as criminally incompetent as most of the adults in Beacon Hills. First of all, with Lydia approaching Tracy as if they’re on a first-name basis, we’re continuing the trend of embedding randos into our leads’ lives with the thinnest of pretexts. Second, Teen Wolf has kind of already done the whole “Am I asleep? Have I slept?” thing, but Tracy is oddly compelling—even if her “night terrors” are a little tame for a show that kills more teenagers than an 80’s slasher. And that brings me to the Dread Doctors, who are delightful. 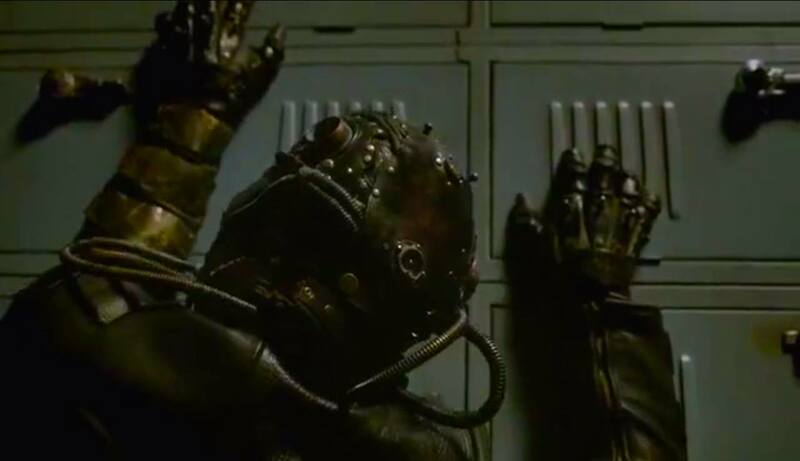 It’s as if the Cybermen and the Rocketeer had a steampunk love baby raised by Freddy Krueger. 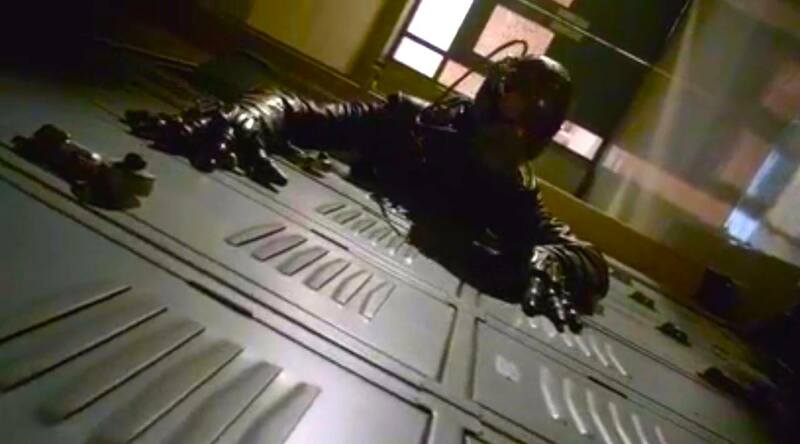 Seeing one crawl out of a locker like a huge, gravity-defying cockroach is especially thrilling. Partway through the episode, Scott consults Dr. Deaton about his latest lycanthropic foe. Deaton responds like a TV news story: vague, but alarming. At this point, I wish Deaton would just admit that he’s just wrong 93% of the time. There’s still no valid explanation for why he lied to Derek about his knowledge of the alpha in season one, or why he withheld his relationship to the Hale pack until season three. Drowning three teenagers to find a magical tree was his idea, and it was a terrible one, even if the rescue was ultimately successful. And now the existence of power-sucking, glow-in-the-dark rave claws has shaken his fundamental understanding of the supernatural world. My favorite line in the episode is a toss-up between Malia’s helpful “You want me to torture him?” and Liam’s strangely endearing “I fell in a hole.” What’s great about the latter, especially, is how Liam’s tone suggests that he’s saying it in an attempt to win Scott’s approval. It’s an adorably nonsensical strategy. And, finally, we find out that Theo is a complete psychopath working his fake parents like hand puppets. It’s…in a word, fantastic. My only quibble is this: not only are Theo and Liam’s names assonant slant rhymes, but they look similar. Theo’s avant-garde haircut and his omnipresent smirk are the only reasons I can identify him in a given scene. So, overall, the episode was uneven. Its greatest flaw was its repetition of tropes that Teen Wolf has already used, from the unnecessary slow-mo sequences to the suicidal birds throwing themselves at windows in a way that is distinctly ominous, but apparently recyclable. If you’re like me, my little teen wolves, you’re all brimming with questions: hasn’t Lydia already taken AP Bio? Why are werewolves always biting teenagers on the hip, of all places? How could Scott have already forgotten that Stiles is almost always right? Why are people’s sisters so frequently showing up dead in Southern California forests? Where the hell did Derek go (previous as it was, the initials D.H. do not an explanation make)? And, most relevant of all, why is everyone and their homicidal mother trying to mess with Scott McCall, alpha-est of alphas?